« WnG Comic to be released September 29th! The World Premiere of the WnG film occurred in Australia this past Sunday. Heavy rain could not keep eager young fans away from the world premiere of “Wallace and Gromit: The Curse of the Were-Rabbit” in Sydney on Sunday. 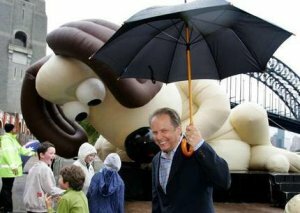 A giant inflatable Gromit that collapsed in the wind could have been a troubling sign. So could two security staff using night-vision goggles to watch for movie pirates. But the world premiere of the first movie featuring the much-loved animated characters Wallace and Gromit proved to be what the eccentric, cheese-loving inventor would call “a cracking day” in Sydney yesterday. There was even free cheese. And the night-vision goggles did not reveal any illegal filming. His latest, Wallace & Gromit: The Curse of the Were-Rabbit, is opening three weeks earlier in Australia than in the United States and four weeks ahead of Britain to catch the school holiday audience. Park was surprised by the England-like weather, which led to the collapse of the giant inflatable Gromit as the audience arrived. “I actually didn’t think it rained in Australia,” he said. While the were-rabbit was too frightening for a handful of very young film-goers, the movie has the same inventive comic charm as the shorts. With entertaining spoofs of King Kong and other classic horror movies, it promises to be “gouda news” for cinemas during the holidays. So the release date in Australia is even earlier than ours, it opens nationwide there on September 15th. This entry was posted on Wednesday, September 7th, 2005 at 9:28 am	and is filed under News. You can follow any responses to this entry through the RSS 2.0 feed. Both comments and pings are currently closed.